What’s black and white and spread all over? Zebra mussels—but they’re no joke. 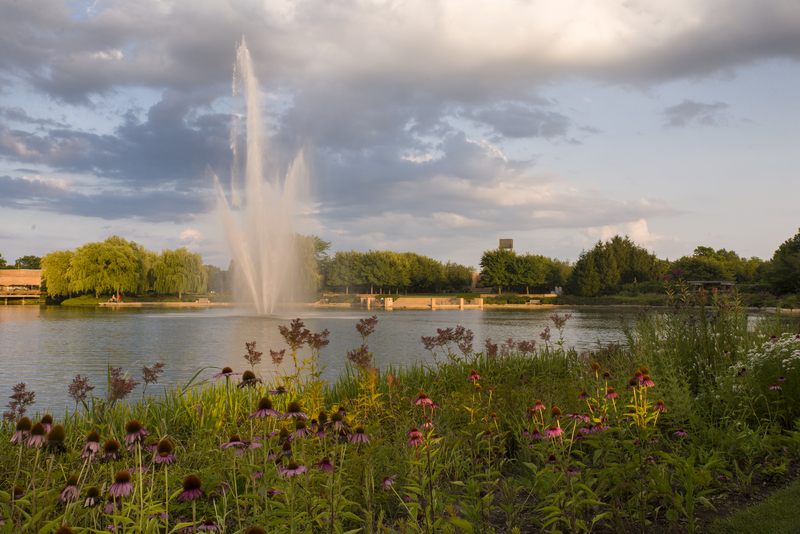 If you noticed more aquatic “weeds” and algae growing in the Garden Lakes this year—or that our beloved Smith Fountain was MIA after mid-summer—read on to find out why. Invasive plants and the problems they pose have been the topic of frequent postings here on the Chicago Botanic Garden’s blog. Now we have another invasive species to tell you about—and this time, it’s an animal: zebra mussels. 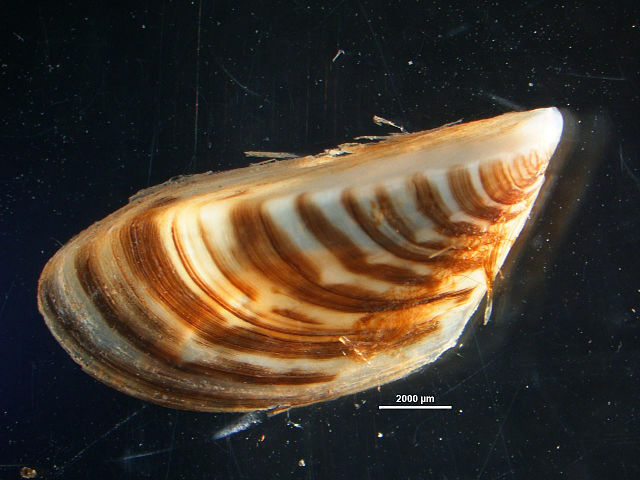 Adult zebra mussels (Dreissena polymorpha) are about the size of your thumbnail. Like many invasive plants and animals, zebra mussels’ native range is a faraway place; in this case, eastern Europe and western Russia. In the past 200 years, they have spread throughout all of Europe and Asia. Here in North America, the first account of an established population was in 1988 in Lake St. Clair (located between Lakes Huron and Erie), likely arriving here as tiny hitchhikers in the ballast water of a single commercial cargo ship traveling from the north shore of the Black Sea. Somewhat remarkably, over the next two years they had spread throughout the entire Great Lakes. Just a year later in 1991, zebra mussels had escaped the Great Lakes and begun their march across North America’s inland waters. (Watch an animation of their spread). Today they are found in at least 29 states. A zebra mussel may live up to five years and produce up to one million eggs each year—that’s five million eggs over their lifetime. A freshwater species of mollusk, they prefer to live in lakes and rivers with relatively warm, calcium-rich water (to help support their shell development). They feed by filtering microscopic algae from the surrounding water, with each adult zebra mussel filtering up to one liter of water per day. Though tiny in size (adults are typically ½ to 2 inches long), their ecological and economic impacts can be enormous. 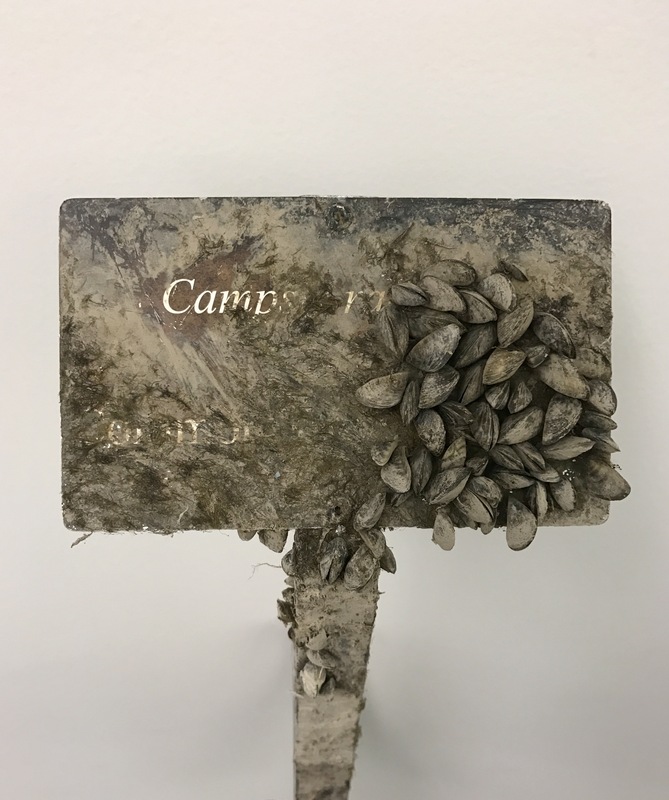 Adult zebra mussels prefer to attach to hard surfaces such as submerged rocks, boat hulls, and pier posts—but they also cling to water intake structures as well as the interior of most any pipe that has flowing water in it (such as drinking water supply and irrigation system piping). From an ecological perspective, zebra mussels’ removal of microscopic algae often causes the afflicted waterway to become much more “clear.” While this clearer water may otherwise seem like a good thing, the now-removed microscopic algae is an important food source for many native aquatic animals. The clearer water also allows sunlight to penetrate deeper into the water, thereby stimulating much more rooted aquatic plant growth. Nearby, zebra mussels were first identified in 2000 at the Skokie Lagoons, just south of the Garden. In 2013 and again in 2014, just a few zebra mussel shells were found at the Garden on the intake screens for our irrigation system’s South Pumphouse. Since so few mussels were found, we were hoping that the Garden’s lakes were simply not a hospitable place for the zebra mussels to flourish. Unfortunately, that thinking all changed in 2015…. These zebra mussels, only a few months old at the time, completely covered this plant label that had inadvertently fallen to the bottom of the Waterfall Garden’s upper pool. At our Waterfall Garden, 1,000 gallons per minute of lake water are pumped to the top of the garden, after which the water flows down through the garden’s channels and then back into the lake. When Garden staff drained the Waterfall Garden for cleaning in June 2015, there were no apparent zebra mussels present—but by September 2015, the entire bottom of the Waterfall Garden’s upper pool was completely encrusted with attached zebra mussels. Needless to say, we were more than a little alarmed. Realizing that the Garden’s lakes could indeed support massive growth of zebra mussels, the Garden’s science, horticulture, and maintenance staff quickly came together to devise a remediation strategy that would protect two critical components of the Garden’s infrastructure from “clogging” by zebra mussels: our irrigation system (which utilizes lake water to irrigate nearly all of our outdoor plant collections) and our building cooling systems (three of our public buildings extract lake water to support their air conditioning systems). Automatic backwash filters like the ones pictured here will be added to each of the Garden’s three pumping stations that withdraw lake water to irrigate nearly all of our outdoor plant collections. The Garden’s zebra mussel remediation team drew upon the best scientific expertise available in North America, which confirmed that there is no scientifically proven approach for removing all zebra mussels from a body of water. The team explored all potential options for eliminating zebra mussel impacts on our infrastructure, and ultimately settled on two approaches: first, the installation of automatic backwash filters to keep even the tiniest of zebra mussels from getting into our irrigation system (the youngest zebra mussels are about 70 microns in size, or about the width of a human hair), and second, the installation of conventional closed-loop “cooling towers” on the three Garden buildings that currently use lake water for air conditioning (thereby discontinuing all withdrawals of the lake water for building cooling). Final design of the backwash filtration systems and the cooling towers is currently underway, and our intent is to have everything installed and operational by spring 2017. The Garden’s aquatic plant harvester cuts and removes excessive aquatic vegetation and algae from the Garden lakes. If you visited the Garden in 2016, you probably witnessed some of the zebra mussels’ ecological impacts to our lakes. Mid-summer lake water transparency in our lakes typically is about 3 to 4 feet—but in 2016, this increased dramatically to about 6 feet (likely due to the zebra mussels’ filtering abilities described earlier). This clearer water resulted in much great submerged aquatic plant growth in our lakes, and our aquatic plant harvester struggled to keep up. Many visitors commented that there was much more aquatic “weed” growth in the lakes this year—and they were correct. In fact, there was so much aquatic plant growth in our lakes this summer that the water intake for Smith Fountain in the North Lake became clogged and the pump burned out. Look for a repaired Smith Fountain (with a more clog-resistant intake) to reappear next spring. The Smith Fountain (which is illuminated at night) is an acclaimed feature in the North Lake. While there currently is no known way to eliminate zebra mussels from freshwater lakes and streams, Garden researchers intend to utilize the new aquatic research facilities in the emerging Kris Jarantoski Campus to explore experimental approaches, such as biological control agents, to potentially lessen the zebra mussels’ ecological impacts to our 60-acre system of lakes. Stay tuned. What a fascinating though disheartening post. I noticed an explosion of aquatic plant growth in the Skokie Lagoons and Des Plaines River this year, to the extent that I gave up kayaking in them for most of the season, frustrated at having to push rather than glide through the water. Is there coordination among the Garden and other aquatic experts in the Cook County Park District and elsewhere to fight the mussel? How effective are aquatic weed harvesters at keeping waterways clear (I know they won’t solve the mussel problem, alas)? Thanks for your comment. Unfortunately, there is essentially nothing that can be done to rid a waterway of zebra mussels once they have become established. The mussels are established in other portions of the Chicago River system and the Forest Preserves of Cook County, including the Skokie Lagoons to the immediate south of the Garden. 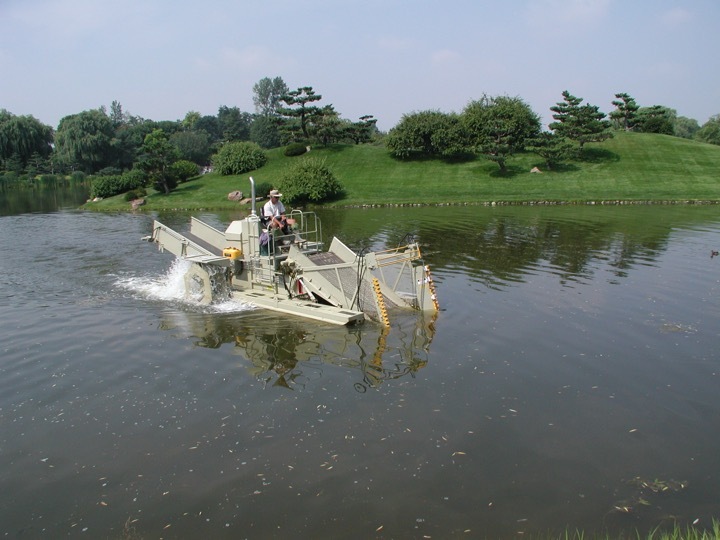 Aquatic plant harvesters can be used to clear nuisance levels of aquatic vegetation, though they are rather expensive to utilize on a large scale. Hi Bob: I enjoyed reading your article on zebra mussels in aquatic systems in the Chicago Botanic Garden. I collected the first zebra mussel in the Chicago Area Waterway System (CAWS) in April of 1989. The mussels were collected in bottom sediments at Western Avenue in the Chicago Sanitary and Ship Canal. It should be noted that zebra mussels have been shown to biomagnify inorganic (e.g., trace metals ) and organic (e.g., PCBs) chemicals increasing the risk of toxic exposure to animals higher in the food chain (e.g., fish). Well hello there, Irwin! Great to hear from you. Others reading this chat might be interested to know that Irwin Polls and I go back nearly 40 years–when the science of “aquatic biology” was in its relative infancy. Irwin was arguably the first aquatic scientist in Cook County (and the greater Chicago region for that matter) to systematically monitor and assess the ecological health of our waterways. They can be killed by treating the water system with a strong solution of Bleach. However they mussels can hold their water (breath) for up to 30 minutes. Whether that is feasible in the irrigation system is another question. Power plants on the Great Lakes were doing this 20 years ago. Thanks for your comment. We did study continuous injection of sodium hypochlorite (aka “bleach”) as a way to control zebra mussels in our irrigation system. 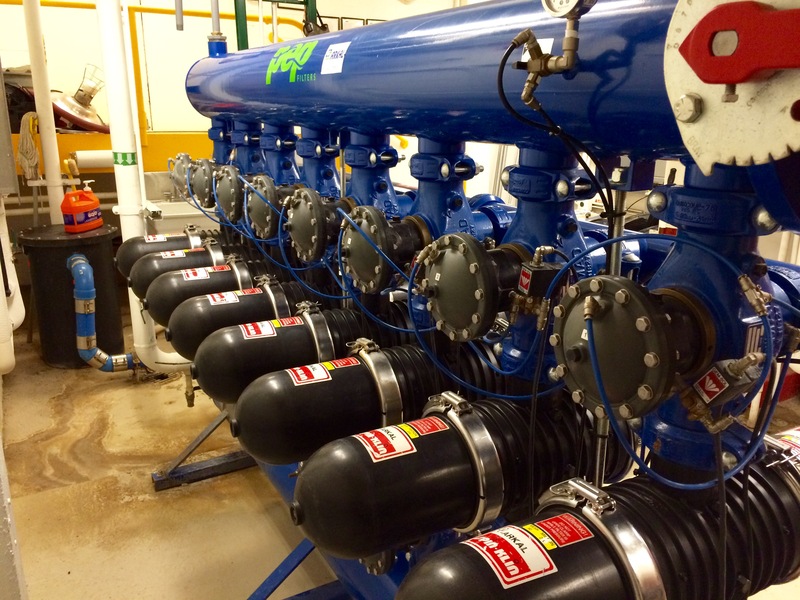 After looking at both the initial installation costs for the injection system as well as the ongoing chemical costs, the use of automatic backwash filters compared favorably from an economic perspective–along with the fact that we wouldn’t be handling a highly caustic chemical on the Garden’s property. Marrone Bio in Davis, CA has developed a nom-chemical control product for Zebra mussels. Look for Zequanox. Thanks for your comment, Maureen. We did carefully study the use of Zequanox for application here at the Garden, and its inventor was on our advisory panel. Unfortunately, it has not yet been shown to be cost effective for large-scale applications (the Garden Lakes are 60 acres in size), and its inability to keep 100.0 percent of zebra mussels from colonizing within our irrigation and cooling systems rendered its application inappropriate for us.